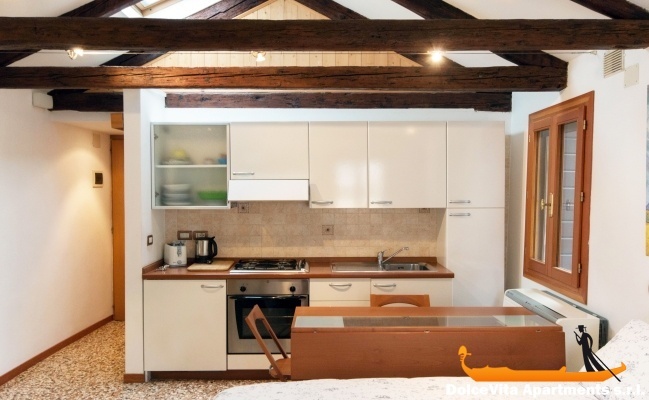 Apartment N. 137: It can accommodate up to 3 people, it is rented from 100 € per Night (not per person). Bright apartment of approximately 30 mq on the third floor with independent entry, embellished with authentic venetian floor and oak-beamed. It is a studio apartment with a well-furnished kitchen on one side and a queen-size bed on the other, with the possibility to add a third bed. The queen-size bed can be substituted by two single beds. 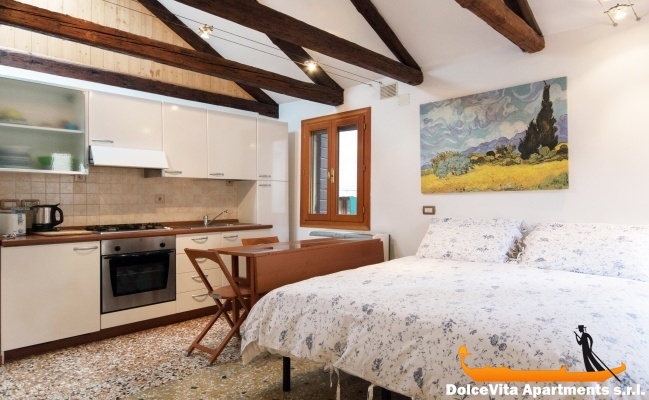 The studio is situated in a central position, few meters far from the popular "Strada Nova" and less than a hundred meters from the comfortable boat stop Cà d'Oro. 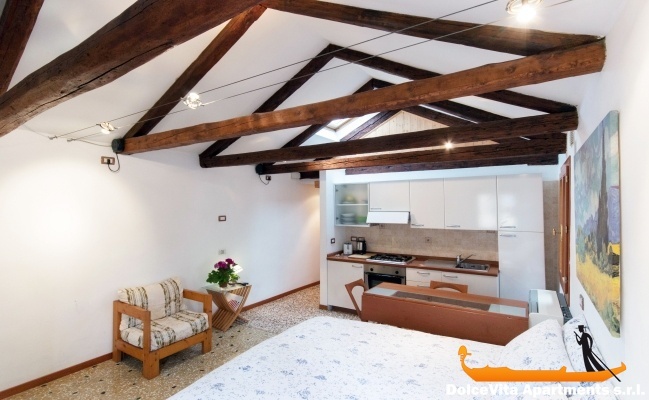 The area is characterized by a great location just a few minutes walk from the Rialto Bridge and directly opposite to its characteristic fish market and fruit and vegetables. On the ground floor of the building, you will find a communal laundry room and also a room where you can leave your luggage on departure day. Apartment clean, quiet, very well located next to all amenities. Very good quality / price ratio. Cristina that greeted us was charming, on time and good advices for our arrival. Perfect. Excellent service as well as the welcome. Apartment clean and comfortable, in a great location. We are very satisfied. A few words about the apartment?? ........ WOW !!!!! These large ceiling beams and the many shuttered windows + skylights ..... great !!!! Very nice! 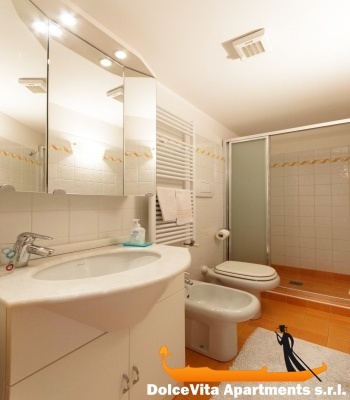 Beautiful large bathroom, in short .... a beautiful place, very clean and more ....in a great location. We were enchanted by the charm of this apartment. We could not ask for more .... thank you! What a wonderful place to stay. Quiet, clean, well supplied with all you need. Very thoughtful Cristina. Loved the central location. The sound of the bells up there was worth the stairs. 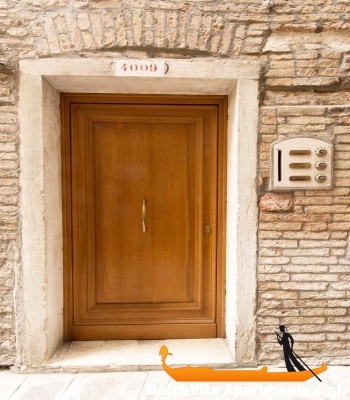 He was small but comfortable, well located in the historic quarter of Venice. We were welcomed very kindly by CHRISTINA. We had no surprises and we will recommend your site to other friends who want to stay in Venice. Very comfortable, It has everything you need for a holiday thanks to its great location. we enjoyed our stay at Ca d'Oro. The apartment is well located, clean, well furnished and equipped: but a little smaller than I thought. It would lack an armchair to make it really comfortable for two. Communications have always been easy, quick answers and the reception service was very courteous. So I give an overall rating of 4/5 and I'll recommend this apartment without hesitation. -Vicino a un negozio di alimentari: Bella, per alimentare il frigo. Abbiamo trovato 2 internet café a 5 minuti di cammino. Super bright, great location, quiet, clean, functional, perfect. Beautiful and well equipped apartment in an excellent location, and a very friendly and helpful hostess. We attribute 5 points to the apartment, very comfortable and light. 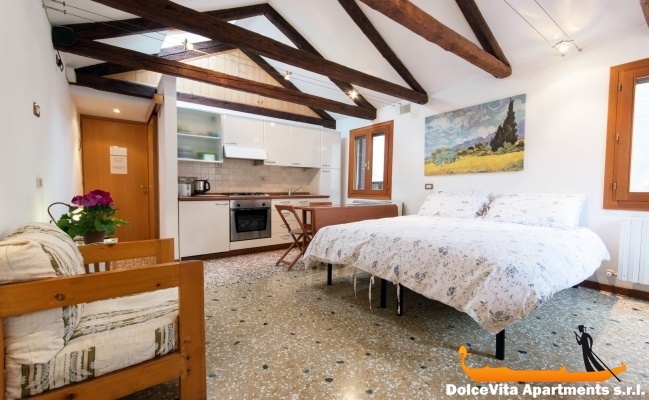 The apartment is very well located in a living area, easy access, whether from Piazzale Roma or Fondamenta Nove. In addition, all parts of Venice are accesssibles walking: if you like walking, you can move through the city without ever taking the vaporetto ... except to go to the islands, of course!